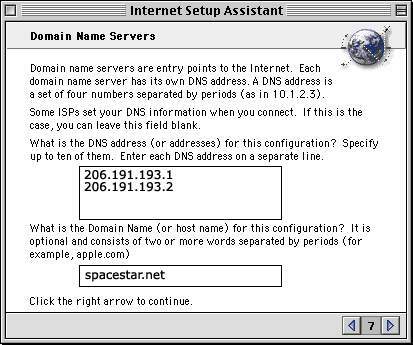 Spacestar Communications - Windows 95 / 98 Dial Up Instructions. Thank you for selecting Spacestar Communications as your service provider. Please keep your username and password in a safe place to ensure that they are not used by anyone other than yourself or authorized users. 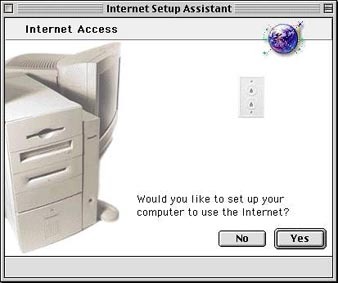 Click 'YES' when asked if you would like to set your computer up on the internet, and then 'YES' again when asked if you have an internet account. Select the type of modem you are using in your computer and also the correct port. If you have voice mail on your phone line, you may want to select 'Ignore Dial Tone'. If you have messages waiting, you will not be able to dial out until you retrieve them from the voice mail system. Proceed to the next screen. You will be asked for your local dial-up number, username and password. You can find your local dial-up number on the last page of these instructions. When you have completed this, proceed to the next screen. 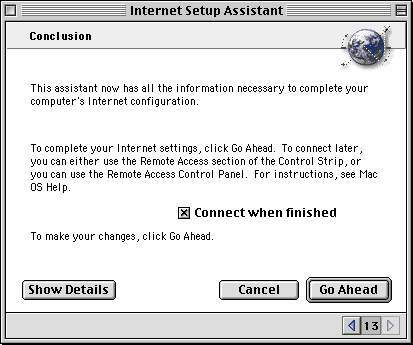 These steps will walk you through configuring the network components on your computer for the Internet. 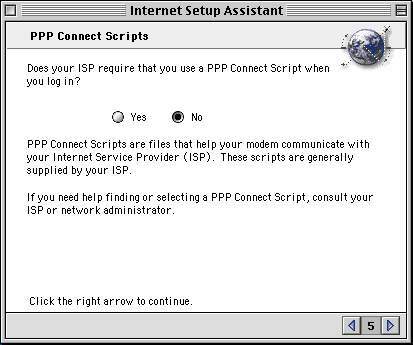 The service does not require that you use a PPP script to connect, so check this option 'NO' Click the right arrow to continue to the next screen. 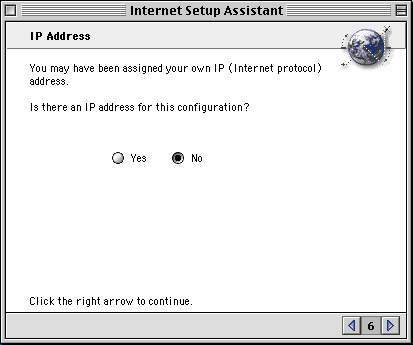 Select 'NO' for this screen, as you are assigned an IP address automatically when you log on. If you wish to obtain a static IP address, (one that will never change when you log on) please contact Spacestar for more information. Domain name servers are what look up the Internet sites on the web and assign them to the IP addresses behind the names. Enter these two sets of numbers and the domain name below to ensure that you won't have any problems accessing web sites. Click on the right arrow to continue to the next screen. These steps will guide you through setting up your E-Mail account. Doing this will allow you to send and receive E-Mail from friends and family. Enter your username and password in the fields shown to the right. You can leave the default quoting character as it is. Click the right arrow to continue. When you have finished this, click the right arrow to continue. Click no for the option to use a proxy server. You have now completed the setup. You will be prompted to connect right away, or go back to another application and connect at a later time. 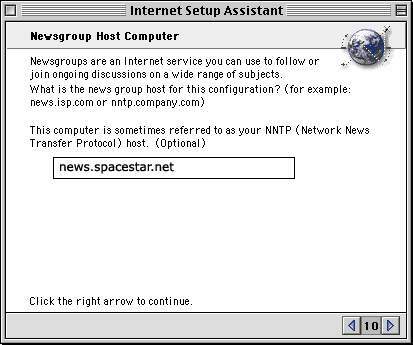 You have just completed the steps to create a dialup connection to Spacestar. You can connect now, or do so later. 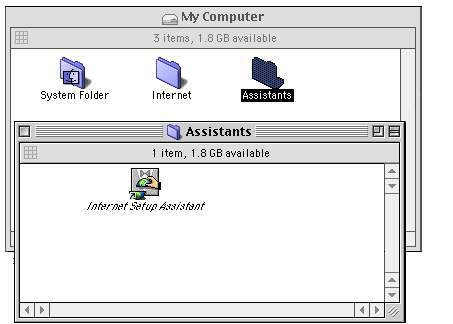 If you need basic start up software, more setup information, or are having trouble logging on, please contact us.